Tuesday, August 14th, Top of the Park, doors open to the public at 8:01 PM. 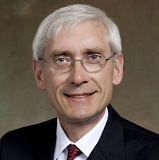 MADISON – On Tuesday, August 14th, 2018, Evers for Wisconsin will hold a primary election night party with supporters at the Best Western Premier Park Hotel in Madison. Supporters will gather after polls close beginning at 8:01 PM to watch returns come in.